Renowned eyewear brand Oakley has reached its highest performance with the most ground-breaking sports eyewear collection of the last decade: Jawbreaker, Oakley’s newest model in the industry. 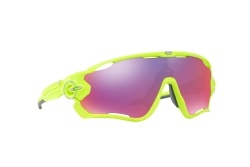 In response to international athletes’ demands, these are the best sports glasses in the industry at the moment. After several months of production with the fastest professional cyclist Mark Cavendish’s collaboration, who has been a consultant of the brand, Oakley has engineered this frame with new ventilation systems and cutting-edge technology that has made some research on angles of view that are essential to cyclists, with the objective of expanding their field of view. Jawbreakers are a 44% larger than standard-size sunglasses. 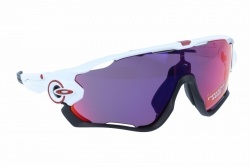 Oakley pursued with the design of this model to present a pair of sunglasses that protect cyclists and athletes in general in a better way, without compromising their field of view or the airflow that helps them being comfortable and reduces fog build-up. Ventilation system is situated far from the eyes to avoid any distraction. 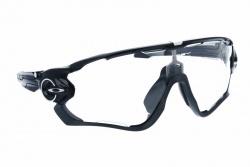 Oakley Jawbreakers offer very fast and safe lens swap thanks to Switchlock™ technology, which makes use of a hidden lock to release the lens and allow quick gripping of the new one. In addition, Prizm™ technology (used for Oakley road lenses) enhances vision in both bright light and shadows, what makes it possible for cyclists to spot changes, no matter how subtle they are, in the texture of road surface. Temples that adjust to three different lengths and offer easy and safe gripping and they can be combined with different types of helmet. Thanks to Unobtainium, a hydrophilic synthetic, adhesion increases under wet conditions to offer better gripping when sweating. Prizm Road lenses enhance vision enhances vision in both bright light and shadows, what makes it possible for cyclists to spot changes on the road surface. Prizm Trail improves perception of red and brown colours so that cyclists can easily spot sand, rocks, roots and any bump on the road under poor light conditions. Based on years of innovation, Oakley high-performance sunglasses offer total protection under high-speed conditions and large mass impacts. 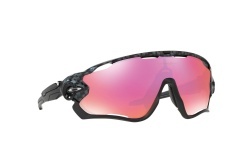 Protection is an advantage of high-quality materials and unique engineering from lens and frame combination by Oakley. High Definition Optics is a series of patented technologies that allow Oakley sunglasses to meet and even exceed testing regulations recommended by ANSI(American National Standards Institute) regarding optical clarity, visual fidelity and impact-resistance.